In 2010, my manager and I decided to create a formal marketing plan and increase our outreach. It seemed a sensible time to do so, since we had recently completed a survey that showed a gap in our colleagues’ awareness of our services, especially our research services. We had our loyalists, but it was clear, to us at least, that many more people could benefit from what we had to offer. And as corporate libraries were going belly-up all around us, expanding our ­ customer base seemed like the most basic of survival strategies. Since my background was in communications and I had done some extra coursework on marketing in graduate school, I was tapped. Eager to impress my new boss (I’d been with Lockheed fewer than 6 months at this point), I rushed back to my desk, ready to get started and was suddenly hit by the sheer size of the group of people I was expected to reach: 10,000 potential customers. And I was alone on this project. I panicked. When I was done panicking, I realized that I needed to break my block of customers down into more discrete groups. I needed market segmentation. Market segmentation is the process of placing potential customers into groups of people who have similar needs and behavior patterns and therefore will respond similarly to a marketing appeal. Retailers are constantly crunching data that looks at customers’ locations, demographics, buying patterns, etc., to create their marketing strategies. As corporate librarians, we may not have access to the same kinds of detailed information or the mathematical formulas that those marketers use, but there are still several ideas and techniques we can use to better understand and market to our internal customers. From my marketing coursework, I knew that I shouldn’t start by drawing up a chart that divided my customers into every category I could think of. So instead, I spent some time defining my immediate marketing goals. What, precisely, was I trying to accomplish? For the Orlando library, we specifically wanted to address our research customers (as opposed to customers who primarily used the circulating library). “Research customers” are people who access our databases to do their own research, contact us to perform research for them, and subscribe to one of our information-monitoring deliverables. In addition to better understanding the needs and behaviors of our existing customers, we wanted to find groups of potential customers. We wanted, more than anything else, to be able to get a group of potential and existing customers who all had similar needs into one room and tailor our spiel directly to those needs. I took a look at the metrics that were available (names, IDs, managers, departments, etc.) and created a master list of customers. I looked for patterns: Was there a specific resource that a specific group was using? I examined my most reliable customers closely. When doing my analysis, I focused a lot of energy on these customers. What databases did they access? What kind of requests were they coming to me with? Once I had exercised the data I had at my fingertips, I was still a tad overwhelmed. I had names, and I had interests, but what tied my customers together? How would I ever parse such a large group of people? The solution, for me, turned out to be the company directory. The Missiles and Fire Control directory included organizational charts that allowed me to group my customers by managers and, ultimately, by the vice presidents their managers reported to. Even better, departmental SharePoints often had detailed charts explaining how people were grouped within the larger group. Finally, our internal HR tool allowed me to look up job descriptions, which helped me figure out some of the subtleties between different job roles within our core customer areas of engineering, finance, and business development. Not only did this help me get a better idea of where my existing customers were, it also helped me speculate about my potential customers. Chances are that if three engineers in a group of 12 were using overlapping services, then the nine other engineers in that group needed them as well. 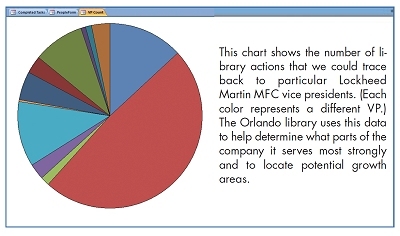 Directories also allowed me to group potential customers by location (the Orlando library supports several other MFC sites in and out of the state) so that we could decide how to best reach out to our customers who aren’t at our physical location. For example, I was able to see that there were more employees in research job roles at Facility A than there were at Facility B, which was primarily manufacturing. This enabled us to differentiate our outreach to the sites based on each location’s individual needs. Not all of my resources were web-based. As I examined my numbers, made lists, and scoured charts, I had to also talk to my customers. I had some survey data to go by, but I also made a point of following up with more in-depth discussions. Even without a formal survey or meetings, I made sure to take the time to chat. I asked my customers what other teams their group works with; sometimes I would find that several research groups from the far corners of the organization were working on the same things. Once I started to get an idea of how customers were grouped, I was able to get on their meeting agendas. I didn’t wait to be invited; I asked to come and present. I found that this sort of information gathering got easier as it went on. At first, I was asking my customers specific questions and occasionally dragging answers out of them. The more I asked, the better I got at knowing what to ask and the more accustomed people became to sharing information with me. Now, a couple of years later, these relationships are second nature, and I’m regularly invited to all sorts of informative meetings. As I gathered data, I began grouping customers in my head. At first, I was tempted to avoid acting until my information was “finalized.” I soon realized, however, that this was an ongoing process, and there is no “final.” The level of detail and types of segments needed vary greatly by industry, but for us, for example, I made some of our customer and potential customer areas very broad: Communications was a single segment, and human resources was a single segment. There are many library users in these groups, and we do tailor promotions and products to them, but they are not very diverse groups in terms of needs. However, our bigger customer groups became more detailed. 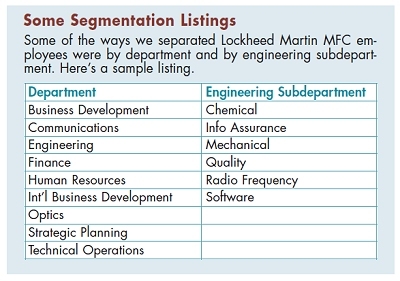 Lockheed is an engineering company, and engineers are without a doubt our largest customer group, so I created several segments depending on people’s needs, area of the company, and job roles. I did the same for our business development customers because their needs are very specialized according to the programs they work on and/or the countries they work in. Since people in these two departments tend to be the heaviest users of our databases and custom research, and there are a large number of potential users, it was worth the time and effort to segment them at a more detailed level. Another lesson I took away from this assignment is that information is there to be used. It wouldn’t do anyone any good for me to gather all of this data and to neatly segment my customers if I never made use of the information. I could not allow myself to get caught up in the “refining forever” trap, where I would keep gathering information and keep refining my segments but never reach out to anyone or change a single product. So after about a month and a half of devoting several hours a day to segmenting, it was time for me to take action. Segmenting allowed me to walk into conference rooms full of potential customers and be confident that I knew what they needed (at least in part). More than once, I had new customers calling by the end of the day looking to be added to our newsletter distribution lists or asking for specific research to be done. Once, I had an engineer follow me straight back to the library from a meeting to discuss a topic that he needed a literature search done on. Segmenting also allowed our team to see needs that we never would have known about if we’d simply waited for someone to call and say, “Hey, we need this subscription” or “Could you set up news monitoring on this topic?” For example, I was able to propose a new newsletter on nuclear energy that has been very well-received. Its subscriber numbers grew very quickly. Remember that segmenting is an ongoing process. I initially only focused on my customers’ job areas and needs, but soon I realized that I should also be segmenting according to age and career path. Also, Lockheed made some structural changes that brought new groups onto my radar, and I had to balance my market segments there too. If you keep your eyes open, as a librarian and as a marketer, for information that affects your customers, then soon segmentation will expand from a side project with a short-term goal into a new way of looking at your employer, your services, and your customers. Kate Vilches is a research librarian at Lockheed Martin Missiles and Fire Control in Orlando, Fla. She holds an M.L.I.S. from Florida State University (FSU) and a bachelor’s in journalism from the University of Central Florida. Vilches has written marketing plans for the FSU London Study Centre information center and Lockheed MFC Technical Libraries. Her email address is katevilches@gmail.com.